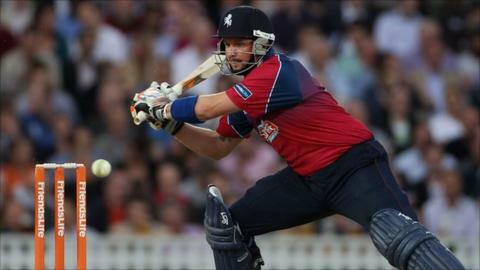 All-rounder Darren Stevens took three wickets and then hit three sixes as Kent beat Middlesex by three wickets. With neither side able to reach the quarter-finals it was something of a hollow victory on a sluggish pitch. Opener Neil Dexter hit 42, but the Panthers struggled against the bowling of seamers Stevens (3-23), Azhar Mahmood (2-22) and Adam Ball (2-18). Mahmood (30) and Stevens (26) then made key contributions with the bat to help steer the Spitfires home.